So many of my friends these days are expecting and are looking for classic but baby-safe gifts and decor for expectant mothers as well as the parents of babies and toddlers that I anted to take a minute to introduce this wonderful shop today. GypsyLaneDesigns on Etsy is a beautiful little shop filled with options for personalized decor for baby and toddler rooms. 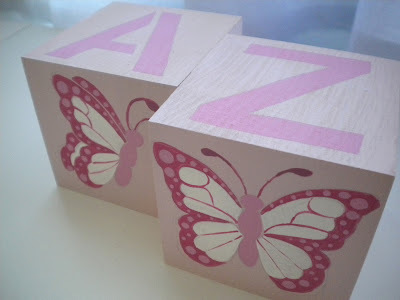 Hand painted baby blocks for book ends, photo props and decor options are scatted through their shop among other wonderful gifts such as picture frames, growth charts, hand painted wooden letters, drawer knobs, alphabet prints, name paintings, step stools and more. All handmade, of course. And many of their products have a custom aspect to them which easily can make whatever you choose into something original and extra special. YOU CAN CLICK ON THE PICTURE ABOVE TO VISIT GYPSY LANE DESIGNS ON ETSY AND TAKE A LOOK AROUND OR, IF YOU PREFER, YOU CAN CLICK RIGHT HERE. If you like what you see in Gypsy Lane Designs' Etsy shop, you may also enjoy visiting the Gypsy Lane Design blog or stopping by to say hi to the artist on Facebook to earn 10% off your order!